Trim the tough ends from the asparagus. Store half of the spears upright in a glass filled halfway with water to keep it fresh for a few days, or until ready to serve. Chop the remaining asparagus and place it in a food processor. Add the mint, parsley, tarragon, cheese, pistachios, garlic and lime juice. Add the EVOO, pouring to a count of 6 (1/3-1/2 cup). Season with salt and pepper. Pulse until the pesto comes together. Place in a small container and store in the refrigerator if not using immediately. To serve, bring the pesto to room temperature and place it in a large, shallow serving bowl. Slice the reserved asparagus spears on an angle into 1 1/2-inch pieces. Bring a large pot of water to a boil for the pasta and season with salt. Cook the pasta for 5 minutes, then add the peas and chopped asparagus and cook for 2-3 more minutes. 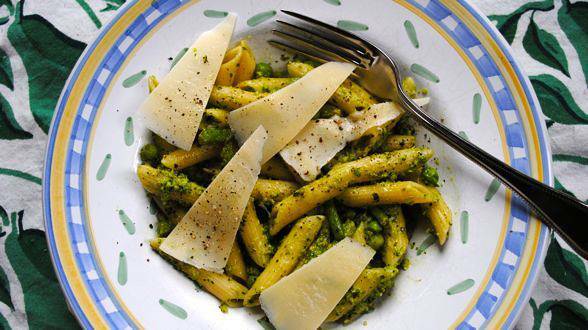 Scoop out 1 cup of the starchy cooking water and add it to the serving bowl to thin the pesto. Drain the pasta, peas and asparagus and add to the bowl. Toss for 1-2 minutes to combine. Season with salt and pepper and garnish with the shaved cheese. Cook’s Note: The pesto can be stored for up to 5 days in the refrigerator. In Recipes-list.com we have selected the most viewed recipes from category - uncategorized . Enjoy the best recipes specially selected for you! Asparagus and Pistachio Pesto Pasta is the right choice that will satisfy all your claims.